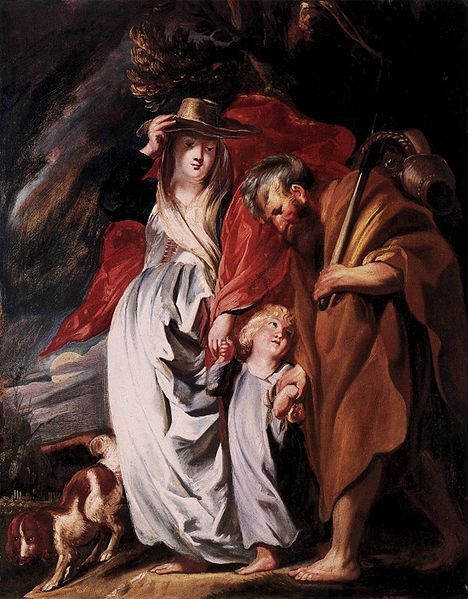 Not just Boxing Day, Return Unwanted Gifts Day, or Two Turtle Doves Day, the second day of Christmas has enormous theological importance: It reminds us that when the angels returned to the realms of glory and the shepherds to their fields, Mary and Joseph still had a child to parent. What does it imply that Jesus experienced childhood? It’s not a question that the Bible dwells on. The two “infancy narratives” in the canonical Gospels (Matthew 2 and Luke 2) don’t add much about his childhood: Matthew tells of the visit of the Magi to a boy no older than two, followed by the young family’s flight to and return from Egypt; the same chapter of Luke reports on eight day old Jesus’ circumcision and then his encounter (as a near-six week old, if I’m reading Leviticus 12 correctly) with Simeon and Anna in the Temple. Before Luke even reaches the end of that chapter, Jesus is already twelve. When Matthew picks up the story, Jesus is being baptized by John; his age is unspecified, but it seems clear that he is an adult (assuming there’s any narrative continuity from Luke 3:21-22 to the next verse, he was about thirty). What happened during the intervening years? Well, one lesson here seems to be that we ought not to speculate too much. But if one error is to fill in the gap by telling tales about a somewhat malicious but miracle-working tot, another is to act as if the Christ child sped up time and moved almost overnight from Nativity to ministry. However paltry the details (left for Mary to treasure in her heart, it seems), it is significant that Jesus had growing up to do (he “…grew and became strong,” Luke 2:40; “…as Jesus grew up, he increased in wisdom and in favor with God and people,” v 52), that he lived with parents and “was obedient to them” (v 51). 13th c. Madonna and Child (The Yorck Project). 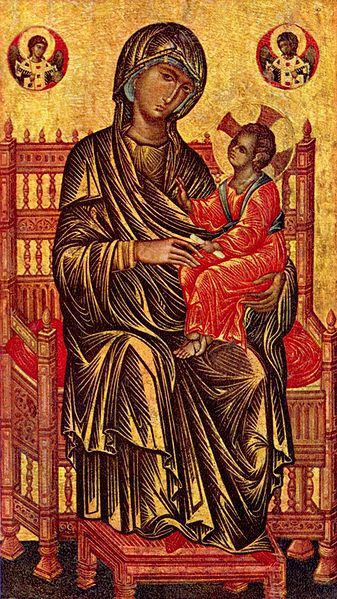 Is it just me, or do Byzantine-style Christ childs always seem like miniature adults? Above all, it’s significant because such a recognizably human childhood reminds us that Jesus, though “being in very nature God,” nonetheless “made himself nothing” (Phi 2:6-7) and shared in our humanity. Yesterday I stressed the importance of Jesus’ birth as Incarnation — the Word becoming flesh. Yet when cloaked in jargon unfamiliar to most contemporary Christians, even that important idea can lose some of its force unless we consider just what human bodies endure in their first hours, days, weeks, and months. One of my former students chimed in with a quotation from her own doctoral research: the 2nd/3rd century African apologist Tertullian reminding us that filth and “nastinesses” accompanied the birth of Christ, that He required as much cleaning and “coddling” as any newborn. (Between writing the last word of the previous sentence and the first word of the next, I had to change a dirty diaper and blow my son’s nose. Honest.) Tertullian’s is an important reminder: Incarnation is not nearly as pristine as theological definition can make it sound. It is messy, even dirty. Carnal. “Why lies he in such mean estate?”, asks another, more thoughtful carol. Why should the Son of God have had to endure the squalor of his birthplace and the relative poverty of his upbringing? Why did the King of Kings have to endure the limitations of childhood and adolescence, dependent on others for nourishment, shelter, security, and care? I’m sure there are many implications to draw here. It should probably encourage us to take all the more seriously the central place of children (especially those without parents) in biblical conceptions of ethics. It’s enlightening to reread Matthew 25:31-46 in light of the fact that Jesus at one point quite literally depended on Mary and Joseph to give him something to eat when he was hungry, something to drink when he was thirsty, to clothe him and look after him when he was sick. The same child lying in a crib in Bethlehem would die on a Cross mere miles away. However one understands the Atonement, only a Christ who had shared in human existence — including the joys and frustrations of human development — could bear the sins of those creatures. And only the Word made flesh, now resurrected and ascended, could then advocate for them as one who is righteous (1 John 2:1) yet compassionate. “Joy, joy, for Christ is born, / The Babe, the Son of Mary,” indeed! Chris, your Christmas blogs have been a marvelous source of fresh thinking and awareness of the nativity, reminding us once again of the forgotten details of the mystery and magesty of it all. Thanks!